I prefer species cannas, or primary hybrids, since they tend to be resistant, but not immune, to the predations of the Leaf Roller Caterpillar. If you prefer the canna hybrids with enormous blooms, buy Dipel Dust by the case and use it often! Most of those listed below will produce viable seed, to sow or use as sling-shot ammunition. Canna nomenclature is in a confused state, some use the names preferred by a taxonomic "lumper", P. J. M. Maas, and others champion the names proposed by the taxonomic "splitters", Koyama & Tanaka. As a result, to be precise, I have had to use the species name in italics, followed by the authority (botanist who published the name) and the year it was published. Thus in one case, I am specifying Canna indica L., 1753, and not C. indica Curtis, 1799. L. refers to Linnaeus (a.k.a. Carl Nilsson, a.k.a. Carl von Linné) the "Father of Bortany" and 1753 to the year he published Species Plantarum, the beginning of our modern binomial system of nomenclature. 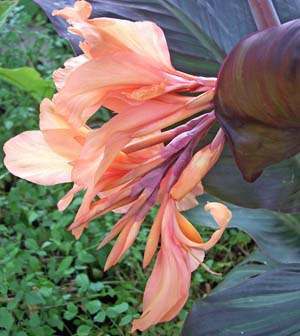 An outstanding heirloom Canna, officially introduced into cultivation in 1902 in France. It has been judged by many to be the most beautiful of all Cannas. The blooms age to an exquisite shade of pink with a feathering of pale golden-salmon. Its maroon-bronze highlighted leaves provide the perfect background to the blooms. Grows 4' to 6' tall in full sun to half-day (afternoon) sun. Looks best if given a deep watering every two weeks during a dry summer. This selection has not been affected by caterpillars in my landscape.